In order to head off the typical left-wing reaction that will arrive in the wake of this commentary – that any criticism of a minority is white racism — I think it is necessary for readers to understand that I have spent a life time in active support of equality for ALL people. I have worked in the inner cities in opposition to racism in education, housing, employment, policing, public safety, public services and anywhere else it is found. I despise racism of EVERY kind. This means that I also call out minority racism. Yes, the so-called “people of color” – blacks, Hispanics, Asians, and Native Americans – can also be racist or manifest racist beliefs in certain instances. Saying so is what will have the folks on the political-correct left calling me a racists. The kindest of them will say that I am a racist but do not realize the fact. Yep! They know better even though they do not know me and have not walked in my shoes. You see, the radical liberal-set believes that it is not even possible for a member of a minority group to be racists. They say as much. That is because the world of the left is a place where fanciful beliefs and political advantage trump reality and common sense. That is why progressivism is more of a political religion than a social science. According to the theory, minority folks cannot be racist because of what they call white privilege. Blacks are the victims of racism, therefore no one in the black community can be racist It is the unique sin of white folks. That is why they myopically see acts of racism only as the actions of whites against blacks. Of course, to a rational person, with a mind that can grasp logic, racism is simply the hatred of a class of people because of their ethnicity. If a Chinese person hates Japanese as a people, that person is a racist. If a Hispanic person hates blacks that is racism. And if a black hates white people in general, that is also racism – not matter how many flawed self-serving theories are advanced. What triggered this commentary was an incident in Georgia. As a child, I had traveled in a few southern states – although not Georgie – and saw the signs that read, “WHITES ONLY” or more directly “NO COLORED ALLOWED.” I recall seeing public rest rooms, drinking fountains and park benches labeled for whites or colored. Thanks to the Internet I recently saw a sign that reminded me of those days of yore. The Bolton Street Baptist Church of Savannah, Georgia was the site of a political meeting regarding their upcoming mayoral election. There were two signs on the door. One read: “NO Audio or video recordings.” So much for transparency. 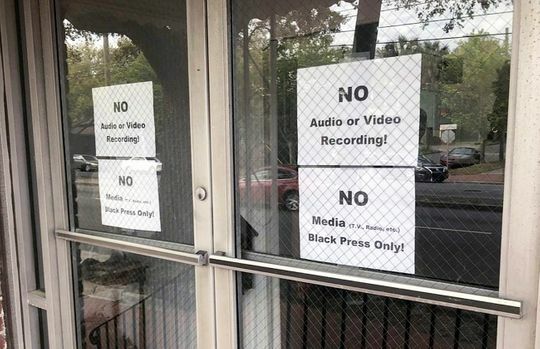 The second sign read: “NO Media (TV, radio, etc.). And then there was that last line: “Black Press Only!” – with that exclamation mark for emphasis. These were not some scribbled signs – the work of some malcontent racist. They were printed. They were the official statement of the organizers of the meeting – presumably the Trigon Group. The meeting was to hear from Van Johnson, one of several black candidates opposing the incumbent white mayor of Savannah. When told by a white reporter that he was denied entrance to the meeting, Johnson apologized but said the sponsors had a right to determine who to allow into the meeting – an argument that ironically was used by white racists in the days of southern segregation. Johnson gave an incredibly stupid solution. Perhaps he was just not thinking fast enough. He promised to hold a meeting for white reporters only – as if the best solution to black racism is white racism. Yes, I called it black racism. That sign is racist to the core. No amount of left-wing political fantasizing or theory-posturing can change that basic fact. This kind of racist backwash against diversity and integration – two things most Americans value – is not a one off. We need to recall the trend on college campuses to create black-only events and assemblies. Blacks have been guilty of hate-crime attacks on whites – although that garners less attention from the liberal media. For some reason, our friends on the left fail to see the irony and inconsistency in all of this. They are color blind to black racism. If they really want that dialogue on race that they so often say is needed – and I am a bit dubious because they seem to avoid it as much as possible — black racism needs to be part of the conversation. Having had many conversations on black racism with black people, I can attest to the fact that it is not as scary a subject as the left seems to think. In fact, there are a lot of black folks who will confirm the reality of black racism within their community. While I do not believe racism is a dominant trait among the American people in general, it is still necessary to call it out when and where it rears its ugly head – as it did in Savannah, Georgia. Post Script: If this were a video commentary, I would have to have Ray Charles singing “Georgia” as a closer.